Audi's first RS car in the US is a cheap purchase, but it will eat your wallet. Unlike AMG or M, Audi Sport hasn't gone overboard putting RS badges on every car Audi builds (at least not in America). Audi currently sells the RS3, RS5, RS7, and TT RS in the US, but rewind back to the early 2000s and the RS offerings were far less common. Only a handful of Audi RS models have made it to the US, but it all started with the C5 generation RS6 sedan. This generation of the RS6 was short-lived from 2002 to 2004 and was only available in the US market for a single model year, 2003. Back in its day, the RS6 was one of the hottest luxury sedans on the market. The 4.2-liter twin-turbo V8 produced 450 horsepower and 428 lb-ft of torque going out to Quattro AWD through a five-speed automatic transmission. The engine was co-developed with Quattro GMBH and Cosworth Technology. 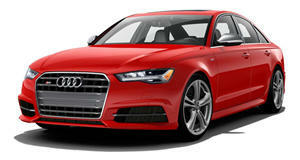 0-62 mph took just 4.6 seconds and Audi limited the top speed to 155 mph. Although many owners claim the speed limiter is very generous, clocking speeds closer to 170 mph. The RS6 bested the 394-hp E39 BMW M5, but was less powerful than the 469-hp Mercedes E55 AMG. Whereas the E39 has become a collector's item, almost no one remembers the C5 RS6. This means prices are very affordable. We found the average price of a used RS6 to be anywhere from $10,000 to $20,000 depending on condition. These are 15-year old cars at this point, so it's no surprise that most have close to 100,000 miles on the odometer. We did find one outlier with a high price of nearly $27,000, but this was a manual-swapped car with a 500-hp tune. Back in 2003, this car would have set the original owner back $82,000. So why is the RS6 so cheap? First, it doesn't offer the analogue driving experience of the E39 M5. BMW kept things old school up until the E39 generation, and now enthusiasts have been rushing to scoop up good E39 examples before they are all gone. The RS6 was built more to be a comfortable Autobahn cruiser than a nimble sport sedan. Even though it weighed around 100 pounds more than the BMW, the Audi understeered at the limit, exhibiting the limitations of AWD at the time. Enthusiasts also like to row their own gears, and the Audi only came with a five-speed slush-box (aside from the home-brew manual-swapped model we found). We can also chalk some of the lack of awareness to the sedan body style. Europe received a better looking RS6 Avant, which would likely draw more attention from enthusiasts. Since the RS6 is a sedan, it has simply become forgotten next to the M5. The RS6 may not be the most well-remembered car from its era, but we still think it represents an enormous bargain in 2018. Low-mileage E39 prices have been pushing towards the six-figure range, so they are starting to leave the realm of possibility for a lot of people. The RS6 is more attainable, but now we have to get down to the real reason why they are so cheap. Audi has come a long way in 15 years, but the company's early 2000s cars are known to be reliability nightmares. If you are intrigued enough to buy one of these, you better be handy or know an honest mechanic. High-priced German cars like the RS6 are known for being well-engineered, not necessarily well-built. We scoured a few Audi forums and found the prices for some of the big ticket maintenance times. These include: front rotors ($280/each), transmission fluid change ($500), oil change ($150), and timing belt ($2,000). These are simple items that can add up quickly on an old car. If you like a challenge, perhaps you can do the work yourself and lower the cost. If not, it may be difficult to find a reliable aftermarket warranty company to cover the RS6. If there's a will, there's a way, and that way is a 450-hp twin-turbo Audi for less than $20,000. It's not for everyone, but the C5 RS6 is still a very cool car for the money.